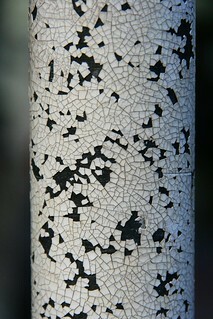 Fissured post of a street sign. Members of a local Wuppertal club, "Rakete e.V." met for a fourteenth photo-meetup. Dieses Foto ist bei dem vierzehnten Foto-Meetup des Wuppertaler Kulturvereins "Rakete e.V." (Link) entstanden. Es ging kreuz & quer durch Wuppertal Cronenberg. This and the photo of the branch make a nice diptych, too.